minister appointed by the president. Large but thinly populated, the West African nation of Mali is one of the poorest in Africa. However, its early history includes a number of powerful and wealthy empires. 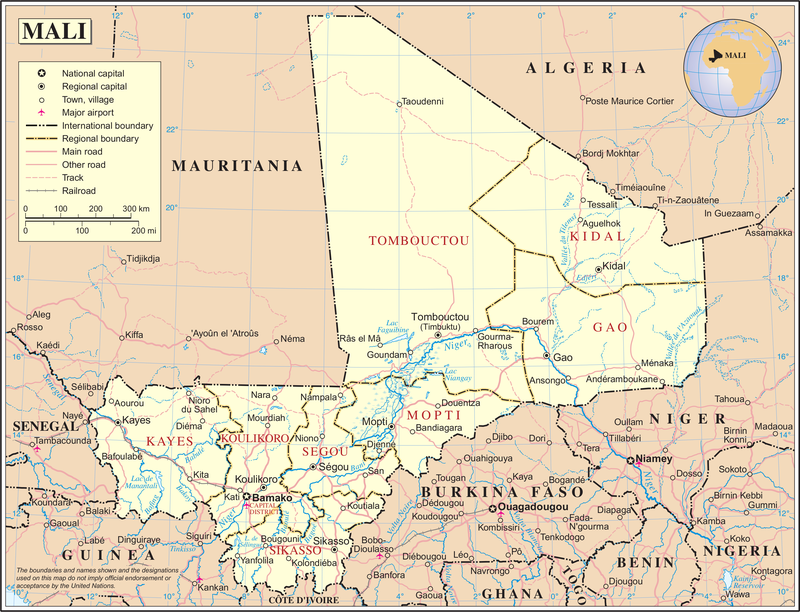 Conquered and colonized by the French in the late 1800s, Mali gained its independence in 1960. Its modern history has involved a series of dictators and military coups, but the recent trend has been toward developing a democratic society. The largest country in West Africa, Mali is about twice the size of Texas. Its land is mostly flat and rocky and covered with poor soils that make agriculture difficult. The only mountain range, the Adrar des Isforas, lies in the northeast. The NIGER RIVER flows through the middle of this landlocked country, providing its only access to the sea. But the river cannot be navigated in all seasons, and it passes through other nations before reaching the sea. Part of the middle Niger Valley is a vast inland delta, where the river has deposited soil and dirt. The Niger floods its delta regularly. When the waters recede, they leave behind shallow lakes, and farmers work the land that emerges. Though generally hot and dry, the climate of Mali varies considerably from north to south. The northernmost region lies within the SAHARA DESERT and endures extreme heat with little rain or plant life. To the south is the SAHEL, a somewhat less dry region with a milder climate but also periods of severe drought. Mali’s southernmost region enjoys the mildest temperatures and the most rainfall, from 20 to 59 inches per year. The south contains small areas of forest, extensive savannas, and most of Mali’s wildlife. Mali has two distinct seasons, dry and wet. The dry season begins in November when a cool wind lowers temperatures throughout the country. In February a hot, dry wind called the harmattan blows out of the Sahara, pushing temperatures to their highest levels. The rainy season starts in late May or early June and lasts until October. Inhabited since prehistoric times, Mali has seen the rise and fall of several powerful empires. Trade in slaves and gold brought wealth to these states. The kingdom of Ghana (unrelated to the modern nation of GHANA) flourished between about A.D. 800 and 1100. After Ghana came the empire of Mali, founded by SUNDJATA KEÏTA in 1235. The magnificent MANSA MUSA ruled Mali from 1312 to 1337. He built mosques and palaces in the city of TIMBUKTU and made it a center of Islamic culture. In the 1460s, SUNNI ALI established the empire of Songhai, which fell to Moroccan armies in 1591. Following the Moroccan conquest, numerous small kingdoms emerged in Mali and West Africa. One of them, Segu, was started in the early 1700s by a group of young bandits and was based on slavery and war. Macina and the Tukulor Empire, both Muslim states, flourished in the 1800s. French interest in the region began in the late 1850s. Twenty years later France launched a series of military campaigns against Tukulor and the other indigenous states, crushing them easily. In 1892 it established a colony known as French Sudan over what is now Mali. The colony underwent several name and border changes in the following decades. Life was somewhat less difficult for Africans in French Sudan than for those in other French colonies. This was mainly because the area had fewer resources the French wanted to exploit. Still, though the French had abolished slavery, they sometimes recruited forced labor for special projects such as building a railroad. They also drafted nearly 50,000 Africans to fight in World War II. Soldiers returning after the war played a key role in the political struggle for independence. Workers, intellectuals, religious leaders, and ethnic leaders were also involved. The colony gained a degree of self-government in 1956 and some more two years later under the name Republic of Sudan. In June 1960, the republic joined Senegal in the independent Federation of Mali. Senegal withdrew two months later, and the Republic of Sudan became the Republic of Mali. Soon afterward, the new nation cut all its political ties to France. The first president, Modibo Keita, governed Mali as a one-party state. He introduced socialism and nationalized the economy. However, Keita’s policies led to an economic disaster in Mali. Dissatisfaction with his rule grew throughout the 1960s as the nation’s economic crisis deepened. In the late 1960s, Keita began to reorganize the government and to reduce the political power of the army. In response a group of young officers, led by Lieutenant Moussa Traoré, launched a coup in November 1968. Although promising to return Mali to civilian government, Traoré ruled Mali through the military for more than a decade. A new constitution created a presidency and a legislature in 1979, but Traoré dominated this government as well. Meanwhile, a long drought brought terrible suffering to northern Mali during the 1970s and 1980s. Traoré ignored the people most affected, the nomadic TUAREG, and opposition to his rule grew. The drought also worsened Mali’s staggering economic problems. Two international bodies, the World Bank and the International Monetary Fund, offered loans and aid if the government sold the national industries and cut funding for public programs. The government agreed despite fierce protests by many people. Another crisis hit in 1990, when the Tuareg launched a rebellion. That same year, students and workers began organizing a pro-democracy movement that led to violent demonstrations in March 1991. Days later, the military staged another coup, led by Lieutenant Colonel Amadou Toumani Touré. The new ruler soon replaced the military with a plan for a multiparty democracy. Free elections in 1992 led to the election of Alpha Oumar Konaré as president, and the Tuareg gradually reached a peace agreement with the government. Since taking power, Konaré’s government has actively encouraged the development of democratic institutions, including a free press and independent radio stations. Konaré was reelected in 1997, but the elections were so poorly managed that many opponents cried foul and took to the streets. Doubt and instability have continued to plague Konaré’s efforts, but he has persisted with reforms. His approach has been to give local communities the power to govern themselves and create their own schools. Meanwhile, foreign investors have begun to see Mali as a generally stable and profitable opportunity, bringing new money into the economy. Although Mali has little fertile farmland, agriculture and livestock are the foundation of its economy. The best land is found in the southern region and along the Niger River. Between 80 and 90 percent of the people work in agriculture. Most of them grow food crops for their own use. Few use modern machinery. Commercial agriculture and livestock are important sources of foreign income. The main export crops are cotton, peanuts, and sugarcane. Cotton is the most important export crop, as it produces about half of Mali’s total export earnings; livestock is the second greatest source of foreign money. However, periodic droughts damage both crops and livestock. Mali also exports fish from its lakes and the inland delta of the Niger River. Though a landlocked country, Mali is the largest producer of fish in West Africa. Mali’s abundant mineral deposits include iron, tin, petroleum, uranium, manganese, bauxite, and diamonds. Most of these resources remain undeveloped, however, because money, technology, and infrastructure are lacking. By comparison, gold mining has attracted considerable foreign investment. In the past salt was the country’s most important mineral resource. For hundreds of years, camel caravans carried salt across the Sahara to the Mediterranean world—and they still do. Though less important today, salt mines still operate in northern Mali. A tiny manufacturing industry produces canned foods, household goods, and textiles. Most manufacturing takes place in Bamako, the capital and largest city. In manufacturing as in mining Mali suffers from a lack of investment, transportation, and infrastructure. Despite its vast size, the country has only a single rail line and few roads, most of which are unpaved. For more than 600 years, Mali has been a crossroads of western Africa, where people from North Africa met those from the sub-Saharan region. Over the centuries, economic and cultural exchanges among these groups have created a web of social relations and commercial networks based on KINSHIP, political alliances, and regional homelands. The population of Mali includes several major ethnic groups, each with its own language and cultural practices. In any given region, however, the differences have blurred through trade and migration. As a result, people tend to emphasize their family name, clan, or place of origin more than their ethnic identity. Black Africans dominate southern and central Mali and are the major force in the political life of the country. Speaking languages of the Mande family, these people combine indigenous black cultures with Islamic traditions. The largest and most important Mande group is the BAMBARA; related groups include the Malinke, Dyula, and Soninké. They make a living mostly by farming, ranching, and trade. In these societies the families are patrilineal—that is, property and power pass through the male side of the family. Authority, especially in rural areas, remains with the eldest male of the family. Some ethnic groups within these societies also divide people according to social origin, with nobles at the top and descendants of slaves at the bottom. A separate caste includes hunters, craftsworkers, artists, and mystics who perform special, sometimes sacred, services for the nobles. What sets this caste apart is that they are believed to control a powerful—though potentially destructive—spiritual or magical force. The main ethnic groups of the northeast are the Songhai and the FULANI. Descended from the people of the ancient Songhai Empire, the Songhai farm and raise livestock. Their traditions have been strongly shaped by Islam. The Fulani, originally nomadic herders, have been forced to establish permanent communities after severe cattle losses in the droughts in the 1970s and 1980s.